The kipper tie was a men's fashion craze that started in 1966. It lasted over ten years and ended in 1979. 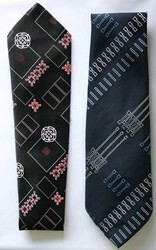 Clarke was writing for an audience that knew what a 1930s tie was like - men in their forties and older. Younger men did not need the explanation. This tells us kipper ties were not new. The wide tie with a bold pattern was a favourite of the 1940s' spiv. Mr Fish was trendy, but expensive. But the fashion spread. Pop royalty favoured kipper ties. In May 1967, Brian Jones of the Rolling Stones appeared in court to face a drugs charge. He wore a navy blue suit with flared trousers and a navy and white kipper tie. By the end of the 1960s the kipper tie had gained a following, but was not worn by every man. Kipper ties from the late 1970s. On the left by Topman (c1978), on the right by Tootal. The kipper tie reached its peak of popularity in the mid-1970s. Nearly every man wore a kipper tie, flares and a jacket with exagerated wide lapels. Watch an episode of the Sweeney, if you want to see the look in action. Once fashions become universal they die. The kipper tie was no longer a fashion statement, but a statement of conformity. For the youth, the kipper tie was already dead. The Punk movement, which began in 1976, started its demise. 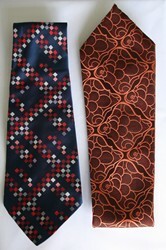 The late 1970s' Mod rivival brought back the early 1960s narrow tie. For the thirty-something man, the kipper tie was also on its way out. In the series 'Breakaway' (1979) Martin Jarvis plays a senior detective. His clothes are fashionable. He wears peg top trousers, some jackets without vents and mid-sized lapels. All these are more associated with the 1980s. He has also abandoned the kipper tie in favour of a narrower one. 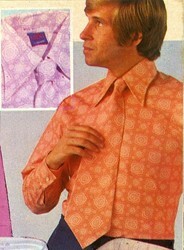 The 70s' kipper tie has never come back. Is it best left in the 1970s?